Gambling is for most intents and purposes illegal in South Carolina. There are no brick and mortar casinos, and South Carolina’s laws say nothing about online gambling or social games. However, recent events have pushed lawmakers to consider changing the laws regarding social gaming. Nothing has been done or changed as of yet, but that’s the most positive actions we've seen from the state in attempt to push poker forward. To learn more about South Carolina's gambling laws and how they apply to you, read our overview below. 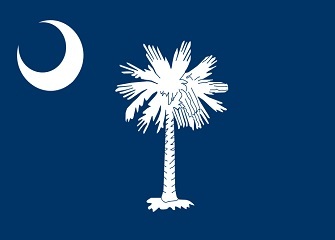 Online poker isn’t specifically mentioned in South Carolina’s laws. However, their stance on gambling, according to the following statute, is very clear. It’s illegal. Except as provided in Chapter 18C of the General Statutes or in Part 2 of this Article, any person or organization that operates any game of chance or any person who plays at or bets on any game of chance at which any money, property or other thing of value is bet, whether the same be in stake or not, shall be guilty of a Class 2 misdemeanor. The problem that we have here is that the state hasn’t made a clear stance on whether or not poker is considered a game of chance or skill. There was a case (Town of Mt. Pleasant v. Chimento) where it was originally decided that the law stood. However, the decision was appealed and the higher courts judge decided that the current law was too old and vague to apply. He said that home games were not illegal nor were they to be considered gambling. But online poker isn't a home game; it's different. Furthermore, in 2011 South Carolina helped authorities seize more than $2 million from shell companies that were created to help process payments for online gambling companies. That doesn't make online poker illegal in the state necessarily, but it does give you an idea where South Carolina stands. There aren’t any laws that mention social games, so at first glance you could assume that the statute mentioned above would apply. However, as I mentioned above, the case of Town of Mt. Pleasant v. Chimento was later overturned by a higher supreme courts judge. He deemed that home games were not illegal nor are they to be considered gambling. That would make home poker games legal, right?! Yay! Not so fast. The decision was overturned yet again, in November 2012. And the efforts to legalize social gaming hasn't come to fruition yet, according to our research. So technically, I think that would mean that social games are still illegal. If you want to press the issue, though, and try to run your own home poker game, I suggest talking to your lawyer and/or local authorities first. They’ll be in a better position to clarify the law and tell you what you can and cannot do. Do Casinos in South Carolina Offer Poker? We receive a lot of questions about gambling in South Carolina. Instead of repeating ourselves we thought it would be helpful to post those questions here for everyone to read. We haven’t heard anything. At this point we’d say no. Here you’ll find recent news updates about changes that South Carolina is making to their gambling laws. We’ll update this section whenever updates come in. November 21, 2012 – The supreme court reinstates a guilty plea for the players in the Town of Mt. Pleasant v. Chimento case. Skill games noted, but ruled irrelevant. Is there an online poker room that accepts players from South Carolina? Yes. Despite the seemingly harsh laws, players are still accepted to and able to play at US accepting sites such as Bovada, Sportsbetting.ag and Sportsbetting Poker. What other forms of regulated gambling is offered in South Carolina? South Carolina runs a state lottery, para-mutual betting and non-profit bingo and raffles. Where can I read more about South Carolina poker laws? Here are some interesting facts about poker and gambling in South Carolina. Gambling is illegal on Sundays. Keeping gaming tables open or playing games on the Sabbath. Michael Phelps was caught holding a bong with South Carolina poker pro Zachary “ckingusc” King. King is known for winning $1.3 million in the 2008 PokerStars WCOOP. He’s also known for bragging about said bong. Tiffany Williamson was born in South Carolina. She is a female professional poker player. Tiffany placed 15th at the 2005 WSOP Main Event, and was featured in the celebrity talk show, Heads Up With Richard Herring.